We believe every surface can be improved with vibrant, eye-catching graphics, and we have the experience to back it up. We wrap everything from giant windows to water towers and company vehicle fleets to tour buses. If you're doing a big QSR/Fast Casual rebrand or refresh of your interior surfaces, and asking, "Will it Wrap?" the answer is probably YES! Tabletop graphics can take many forms—from a simple tabletop logo to a long-term promotional campaign message. Restaurants have been using table space to advertise to their customers for years. Paper placemats, coasters, table talkers and menus are prime spots for up-selling to your customers or reinforcing your brand. A new trend we're seeing in the print industry is table wraps or tabletop graphics. Restaurants are reclaiming the unused table space to highlight their personal brand, longer term promotions, social media channels or connect with a location through geographic imagery or historic photos. Here are a few ways you can use tabletop graphics in your QSR/Fast Casual restaurant. Window graphics can transform your brand and products into a true visual experience. With the right materials and designs, you can add the perfect touch to draw customers into a space. As the largest print distributor of 3M adhesive vinyls in North America, we offer quality materials and complete design-to-install services. Floor graphics are more than just another form of branding; they offer an opportunity to make creative use of space that sticks with your audience in a less conventional way. 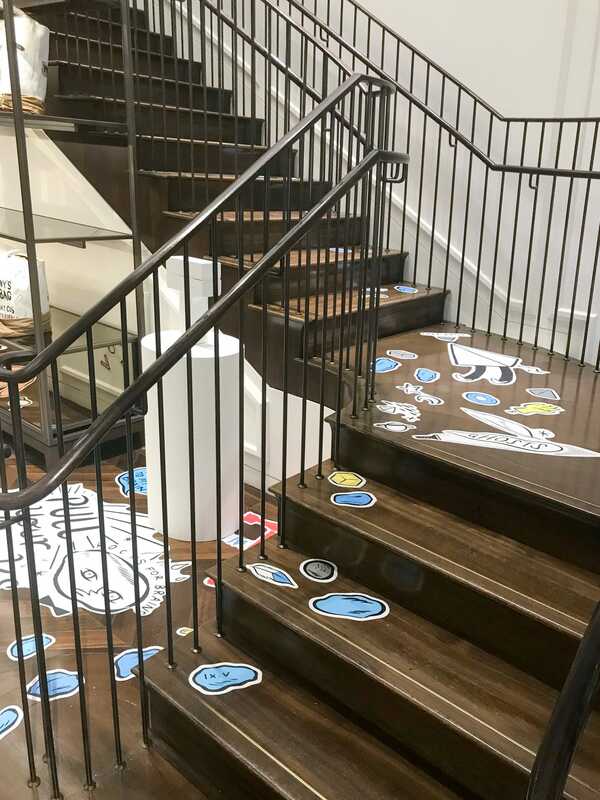 Floor graphics can be adapted for a variety of situations, such as reaching consumers while they shop, promoting an event or seasonal specials, displaying brand identity, or adorning an area with custom carpet. The very nature of a floor graphic means it needs to be tough enough to withstand traffic while still maintaining a vibrant image. Depending on your the application, we can recommend a material that is scratch, scuff, and slip resistant, while also holding up to commonly used cleaning solutions. 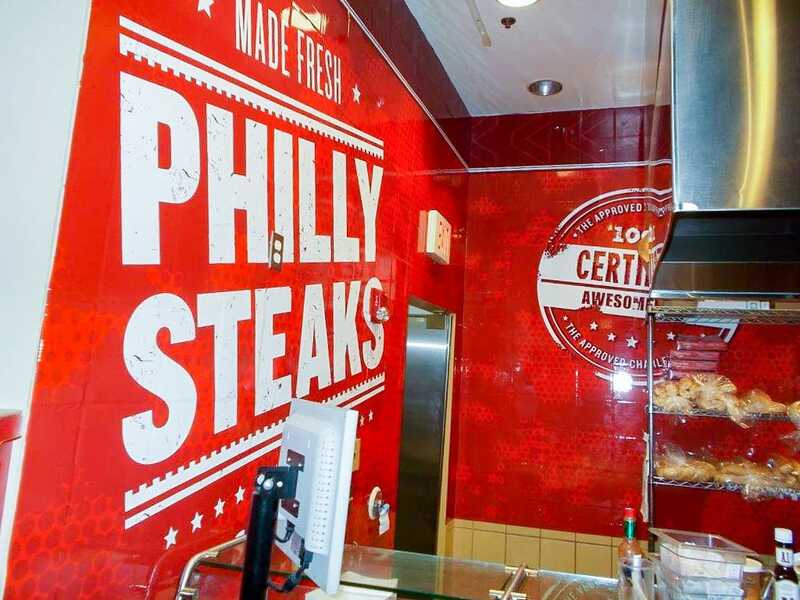 Charleys Philly Steaks has won numerous awards in the Fast Casual and Quick Service Restaurant industry, such as being in the Top 100 Movers and Shakers in Fast Casual magazine, and in Entrepreneur magazine's Top 57 Fast Food Franchises in the World. Our relationship with Charleys began in the fall of 2013 on a store refresh campaign. We began with a single test store, and Charleys appreciated the way the wall graphics we created could be applied to existing tiles. This creative solution saved money and time; instead of removing and replacing tile, it could simply be covered with a bold graphic and the material would retain the "tile" texture. The refresh projects included new branding, marketing icons, and other digitally printed wall graphics and materials throughout the space. Read more about this project here. Even the most rugged surfaces like exposed brick can be brought to life using the correct materials and installation processes. These applications are a great way to turn an otherwise forgettable surface into a valuable marketing opportunity. The examples above are just the beginning! Other products include Interior/Exterior Menu Boards, Window Clings, Floor Graphics, Displays, Banners, POP/POS, Wall Murals, Counter Wraps, Counter Cards, Food Truck Wraps, Barricades, Beverage Coats/Wraps and much more. Learn more about how we can help your QSR and Fast Casual restaurant today.